English Ivy is a perennial evergreen vine that is commonly cultivated throughout North America. 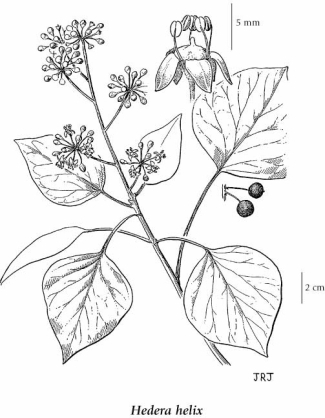 It frequently escapes and becomes invasive in natural areas, particularly near uban centres. Evergreen climbing shrub with short aerial roots; stems up to 30 m tall. Stem leaves alternate, evergreen, entire to 3-5 lobed, 4-10 cm long, leathery, glossy, with long stalks, broadly egg-shaped to triangular. Inflorescence of 1-several, terminal, globose umbels in a racemose arrangement; flowers greenish-yellow, globose. Bluish-black berries, 2-5 seeded, 6-9 mm. Moist to mesic disturbed areas and forest floors and trees in the lowland zone; frequent in SW BC, known from SE Vancouver Island, the Gulf Islands and adjacent mainland; introduced from Eurasia. 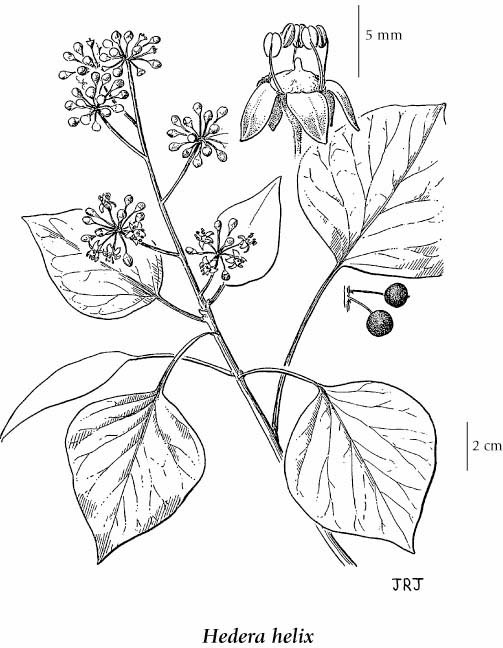 Hedera helix var. hibernica G. Kirchn.